The Giants have finalized a four-year, $41MM extension with wide receiver Sterling Shepard, a source tells Mike Garafolo of NFL.com (on Twitter). 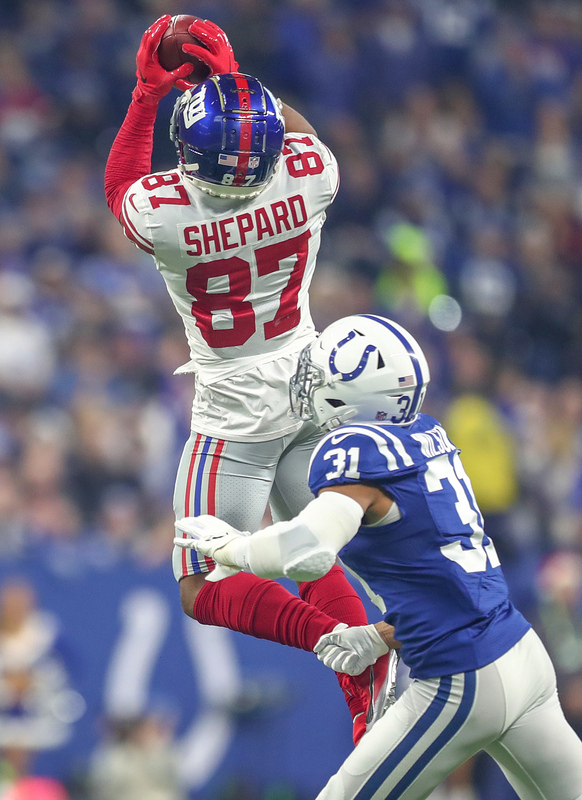 Prior to the extension, Shepard was set to hit the open market after the 2019 season. Shepard, the team’s longest-tenured receiver, is now the club’s highest-paid player at the position. It’s a larger than expected deal for Shepard, especially since his skill set mirrors that of new acquisition Golden Tate. 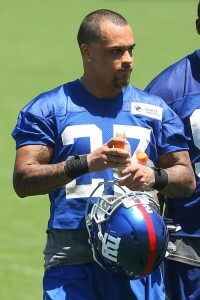 By the same token, the Giants will be relying on Shepard even more now that Odell Beckham is out of the picture. He’ll look to build off of a career year in 2018 when he hauled in 66 receptions for 872 yards and four touchdowns. The 26-year-old spent most of the year in the slot, though he also lined up outside towards the end of the year while OBJ was sidelined. The former 2016 second-round pick and Tate are set to headline the Giants’ WR depth chart with support from the recently re-signed Russell Shepard, Corey Coleman, Bennie Fowler, Cody Latimer, and others. The Giants interviewed interim general manager Kevin Abrams for the team’s full-time position yesterday, lengthening a list of candidates that already includes Giants VP of player personnel Marc Ross, former Giants executive Dave Gettleman and ESPN analyst Louis Riddick. While Abrams had spent the majority of his career as a salary cap guru, he’s focused on proving that he can also build a winning roster. While Giants owner John Mara may be seeking major “wholesale changes,” sources told Vacchiano that Abrams is a serious candidate for the gig. The writer notes that the organization could choose to pair the interim general manager with someone like Gettleman. While many attributed cornerback Eli Apple‘s tumultuous season to immaturity, Dan Duggan of NJ.com explored the true root of the player’s issues. Ultimately, the reporter attributed the problems to “strife in Apple’s family,” particularly a falling out with his stepfather, Tim. “One of the biggest reasons Eli is declining so much this year as opposed to last year is (Tim’s absence),” Apple’s half-brother Dane Blackson said. “I know everyone always talks about the fame and all of the attention and how all of that can go to your head. But you have to imagine that from middle school to the NFL, Tim was there. Tim made this whole thing happen. Tim didn’t miss a game. Whenever Eli looked for that support, that was always there. Now, this year whenever he goes to look for support, it’s not real, it’s not genuine.” Duggan dug more in Apple’s family issues in a must-read article. Jason Pierre-Paul revealed that he’s recovering from a broken finger, although he expects to play this weekend against the Cardinals. Neil Best of Newsday.com believes the defensive end suffered the injury during his early-December matchup against the Raiders. Recently appearing before a congressional subcommittee regarding brain injuries in football, former Lions linebacker DeAndre Levy said his former organization didn’t want him speaking about CTE. “The moment I said anything about it, I had two calls telling me I shouldn’t talk about it,” Levy said (via Kyle Meinke of MLive.com). “I don’t know if it was because it was CTE, or if it was because it’s just the general NFL rule of, like, only football. Only talk about football, only think about football. I posted simply the research … and I was told not to talk about it the first day it was out. And I’m just, like, you know, it could have just been locker room culture. Nobody wants to talk about anything other than football. But it didn’t sit well with me when I’m talking about brain injuries. Levy, 30, spent his entire eight-year career in Detroit. After being named as a second-team All-Pro in 2014, the linebacker signed a lucrative extension with the organization. However, a hip, knee, and meniscus injury ultimately forced him to hang up his cleats, and he’s since spent his team advocating for CTE awareness. Matthew Stafford is listed as questionable for tomorrow’s matchup against the Saints with an ankle injury, but ESPN’s Adam Schefter tweets that the Lions quarterback is expected to play. The 29-year-old is one pace for one of his most efficient NFL season, as he’s completed 64.2-percent of his pass attempts for 1116 yards, nine touchdowns, and only one interception. The Giants placed three wideouts (Odell Beckham Jr., Brandon Marshall, and Dwayne Harris) on the injured reserve this past week, and it looks like they’ll be without another top receiver for at least this weekend. ESPN’s Jordan Raanan tweets that wideout Sterling Shepard is out for tomorrow’s contest in Denver. The former second-rounder has hauled in 22 receptions for 263 yards and one touchdown this season. Jerry Jones spoke at length after Sunday’s Packers-Cowboys game and expanded on his stance about players’ protests that have intensified this season. The longtime owner announced a policy that figures to be a key talking point across the league. Although no Cowboys decided to sit or kneel during the national anthem today, David Irving and Damontre Moore raised their fists. Jones was asked directly about that. It’s not known if the owner considers what the defensive ends did as disrespecting the flag. Jones said he was “not aware” of Irving and Moore’s protests and called the team “very much on the same page together” regarding this issue. The defensive linemen (via Williams) each did not view it as such. Jones’ decree comes two weeks after the owner knelt with his team during a nationally televised game against the Cardinals, doing so before the anthem played. The NFLPA also released a statement after these comments and Vice President Mike Pence’s decision to leave the 49ers-Colts game once players knelt during the anthem. Shifting to on-the-field matters in this division, here’s the latest on that front. Lane Johnson may have a difficult time taking the field for the Eagles on Thursday after suffering a concussion in Philadelphia’s Week 5 rout of the Cardinals. While the Eagles said their right tackle left the game because of a head injury, Les Bowen of Philly.com reports a concussion caused Johnson to miss the second half. Halapoulivaati Vaitai took over for Johnson at right tackle and would seemingly be in line to start there Thursday night against the Panthers, with the league’s concussion protocol making it difficult for players to return on short weeks. The Giants lost four wide receivers during their loss to the Chargers on Sunday, and while Odell Beckham Jr.‘s broken fibula will hit the team hardest, Big Blue also will likely be without Sterling Shepard in the near future. The complementary wideout sprained an ankle and is expected to miss a couple of weeks, Adam Schefter of ESPN.com reports (on Twitter). The Giants believe this injury is similar to one Shepard suffered over the summer. The Giants will travel to Denver next week and will likely have to make roster moves before taking the field against the Broncos, considering Brandon Marshall and Dwayne Harris also left the game due to injuries. Beckham and Harris will be out for sure, with the latter fracturing his foot. Adding to this nightmarish Giants season that’s spiraled to 0-5, Eli Manning underwent a neck X-ray after the loss to the Chargers, John Healy of the New York Daily News notes. The 36-year-old quarterback’s X-ray was negative, however. Manning has never missed a start since taking over in that role midway through his rookie season. The Bills’ decision to fire Roman came as a surprise to him, per Carucci, who tweets that the coach was working on an offensive game plan for the club’s Week 3 matchup with the Cardinals when he received the news. Carucci reported earlier Friday that Roman was not a big Ryan fan and had hoped to head elsewhere at the end of the season. Rookie Sterling Shepard, who caught three passes for 43 yards and a touchdown in the Giants’ Week 1 win over the Cowboys, has the chance to be the team’s next great wide receiver, argues Jordan Raanan of ESPN.com. Former Giants cornerback Prince Amukamara had one workout session with the second-round pick from Oklahoma this summer and came away impressed with his skill set. “His confidence and raw skills … he’s just confident in his ability that he’s going to beat the man across from him,” Amukamara said. “And he’s very sudden at the line, meaning he’s quick. 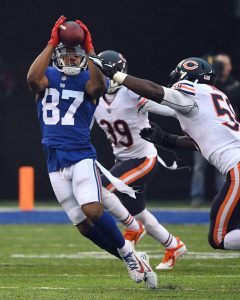 He has a combination of [Victor] Cruz and Odell [Beckham Jr.]’s skill set.” Recently, PFR’s scouting guru Dave-Te Thomas praised Shepard in his rundown of the Giants’ rookie class. Jets receiver Quincy Enunwa could end up as the lone bright spot from ex-general manager John Idzik‘s failed 2014 draft class, opines Manish Mehta of the New York Daily News. Enunwa, a sixth-rounder that year, has begun the season in terrific fashion, having hauled in 13 catches on 14 targets for 146 yards and a touchdown in the Jets’ first two games. The 6-foot-2, 225-pounder appeared in 12 contests last year and failed to find the end zone while amassing 22 receptions on 46 targets. Now, along with the excellent tandem of Brandon Marshall and Eric Decker, Enunwa’s early 2016 breakout has given quarterback Ryan Fitzpatrick another quality option in the passing game. “That’s what we didn’t have last year. We didn’t have a No. 3 guy. We didn’t have a No. 4 guy,” said Marshall. “Quincy is our unsung hero.” Fitzpatrick targeted Enunwa six times in the Jets’ 37-31 win over Buffalo on Thursday. Enunwa caught all six passes for 92 yards. The Saints‘ defensive line couldn’t get any kind of pass rush going against the Raiders in Week 1 and one reader asked Herbie Teope of The Times-Picayune if Paul Kruger can be fairly labeled as a bust signing. Kruger can’t be written off as a bad addition, nor can he be blamed for the lack of pressure on Derek Carr, Teope contends. While Kruger was in on 53 percent of the team’s defensive plays on Sunday, he was restricted somewhat by the team’s defensive game plan along with the rest of the front seven. Carr’s mobility kept the Saints from getting too aggressive, but Teope expects to see a much different plan of action against Eli Manning and the Giants in Week 2. Earlier this month, the Saints signed Kruger to a three-year deal that can be voided after one year. The deal comes with a $2.1MM signing bonus and base salaries of $900K, $1MM, and $1MM. General manager Jerry Reese went to the credit union often during the offseason, spending over $200MM to improve his team’s defensive front seven issues. But, despite some questionable purchases, the draft provided the team with two stud newcomers in cornerback Eli Apple and receiver Sterling Shepard, as both are expected to immediately contribute. Cooper Taylor’s tenure with New York could be coming to an end, especially if third round pick, Darian Thompson, is as good as he advertised during mini camp. While Shepard is expected to at least earn a slot position, he could move outside if Victor Cruz continues to deal with injury issues. If Cruz fails to return to form, California free agent, Darius Powe, or off-the-field bad boy, Roger Lewis, might have a chance to secure the final receiver spot coming out of training camp. Our staff touted Eli Apple as the best cornerback in the draft not named Jalen Ramsey since Day One. We even provided our contracted teams with a very detailed statistical comparison chart that featured Apple, Ramsey, Mackensie Alexander, Vernon Hargreaves III, and William Jackson III. 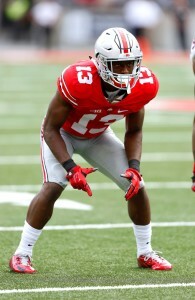 It seems Giants brass agreed, taking the Buckeye with the tenth pick. The early first round surprise could be starting by the time the season opener rolls around, at least as the nickel corner. He’s likely to ease Dominique Rodgers-Cromartie off the roster after the season to take his place opposite high-priced Rams addition, Janoris Jenkins. The first thing you notice about this former Buckeye is his natural playmaking instincts. He understands how receivers are trying to attack coverage and he is a master at reading quarterbacks’ eyes when having to drop into zone coverage. He also does an excellent job of mid-pointing high-low routes. Apple is an explosive, quick-twitch athlete with a sudden closing burst, especially when receivers catch the ball in front of him. He possesses that second gear needed to track the ball downfield and he’s fast enough to recover when gets caught out of position. Thanks to his fluid hips, he can make the smooth transition when forced to change directions quickly. When he stays under control and keeps his knees bent, is a good tackler in space. The two-time letter-winner started all but one of the 28 games he has appeared in. As a redshirt freshman, he collected 53 tackles and broke up thirteen passes, as opposing quarterbacks often tried to challenge the first-time starter. Eight of those thirteen pass break-ups came on third-down snaps and all three of his interceptions were followed by Buckeyes touchdown drives during their 2014 national championship campaign. The Buckeyes cornerback can consistently break up passes when in position, as he also has the athleticism to reach around the receiver and disrupt the action without committing the penalty. When he breaks up those passes, more often it is the result of violent hits right as the ball arrives. While not a valid ball thief, he does have the natural hands to reach out and pluck the ball to make the tough interception. Teams were very leery to fire the ball into Apple’s territory in 2015, and he managed just 28 tackles, as a result. However, he impressed scouts with his outstanding coverage skills, as he not only defended nine passes (including one interception), but only 14-of-67 passes targeted in his area were completed (20.9%). He delivered twenty third-down stops, three more on fourth-down snaps. Proving to be one of the most physical cornerbacks in college, he jammed/rerouted his main pass coverage assignments away from 38 incomplete passes last season, the second-highest total in the NCAA FBS ranks. In short: the future is bright for the Giants’ first-round choice. Continue reading about the Giants’ rookies..
One of our staff’s favorites in this draft class, the Giants found a Hines Ward clone in this sensational Sooner receiver. Shepard plays with a lot of moxie and will soon endear himself to Big Blue fans. With Victor Cruz hoping to return to action in 2015, Shepard will likely fill slot receiver duties but after one look at his performance level, he can easily make Giants fans forget about their injured wide receiver. It is especially pleasing when an “old dog” scout like myself sees a legacy come along. Years ago, while scouting the Midwest, Sterling’s dad, Derrick, captured attention from teams during his career at Oklahoma (1983-86). Derrick had managed to catch 75 passes during his career with the Sooners, also averaging 8.5 yards on 70 punt returns and 24.2 yards as a kickoff returner. He went on to play for Washington, New Orleans and Dallas until 1991, compiling a 9.1-yard average via 75 punt returns, a 15.2-yard average as a receiver and a 19.7-yard average running back 51 kickoffs. Shepard has that explosive playing burst to easily gain separation after the catch. He shows above average lateral agility and balance when changing direction, doing an excellent job of extending for the ball and keeping his feet inbounds when working along the sidelines. He is a smooth open field runner who accelerates instantly coming out of his breaks and he has the burst to blow by defensive backs consistently (see 2015 Tulsa, Texas, Kansas, Iowa State and Baylor contests). He has loose hips and good feet to get in and out of his cuts and his quick first step lets him explode off the line. Shepard also has the hip wiggle and head fakes to elude defenders after the catch. His second level speed can rival any other receiver in the collegiate ranks and he has also become a very a good student of the game, showing keen awareness for the sidelines and chains, along with the presence to come back to assist the quarterback when the pocket is compromised. When watching him on film, his ability to adjust on the move and sit down is evident as he shows fine big-play quickness after the catch. He quickly finds the open areas and works back to the ball, making nice adjustments to the poorly thrown pass. The Boise State master ball hawk will only have to change his jersey to a different shade of blue now that he is joining the Giants. Once considered a late first round prospect, some teams shied away from the defender with a conference record nineteen interceptions under his belt, as he did not perform well in the agility tests at the combine. Still, you can’t teach a stopwatch to play football and his thievery success indicates that Thompson might have some “skills” in that area. Since moving into the starting lineup for the final six games of his freshman year, Thompson was the Broncos’ defensive stalwart. He posted 243 tackles for Boise State, delivering fifteen stops behind the line of scrimmage from his free safety position. While he is not the greatest leaper in this draft class (31-inches), evident by his nine pass break-ups through 51 games, he does show the natural hands needed to make the big plays. Thompson is an instinctive player who is rarely caught out of position. He patiently waited his chance to start as a freshman, spending that time excelling on special teams and using the film room to gain lots of knowledge on his opponents. Thompson shows good ability to learn and retain the playbook. It is his ability to quickly react to the run or pass that might see him use his power and size better as a strong safety at the next level. Former NFL team physician David J. Chao tweeted that he wouldn’t be surprised if NFL prospect Myles Jack falls in the draft due to medical concerns. While the linebacker has recovered from a meniscus tear, Chao notes that there will still be worries of articular cartilage. If the Jets make a move into the top-10 to select either Carson Wentz or Jared Goff, ESPN.com’s Rich Cimini is skeptical that Ryan Fitzpatrick would want to return. By giving up an assortment of assets, the team would essentially be handing the rookie quarterback the keys to the organization. However, Cimini notes that the Jets could also take the unconventional route and let their young signal-caller sit on the bench. There are already rumblings that 49ers general manager Trent Baalke and head coach Chip Kelly aren’t getting along. However, Matt Barrows of the Sacramento Bee isn’t buying these rumors, noting that the pair looked relatively “chummy” at a recent pro day. 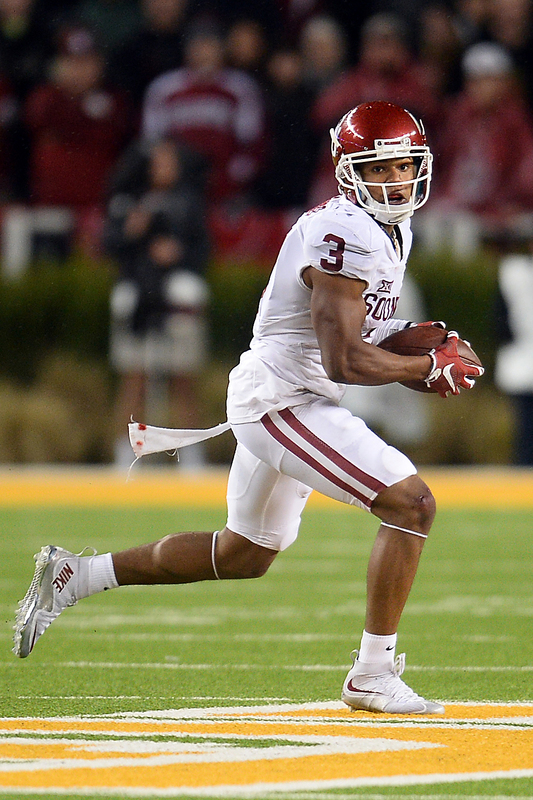 The Texans have interest in Oklahoma wideout Sterling Shepard, reports Aaron Wilson of the Houston Chronicle. The senior compiled 86 catches for 1,288 yards and 11 touchdowns during his final season at Baylor. Houston has also expressed interest in Baylor receiver Corey Coleman and Notre Dame wideout Will Fuller.